objects of SEANA. Members are located in south-eastern mainland Australia. The association was formerly known as the Victorian Field Naturalists Clubs Association (VFNCA). fostering and encouraging activities which promote the appreciation and study of natural history. supporting and promoting conservation issues. to be acknowledged to be a responsible voice on natural history matters. to improve and stimulate communication between members. 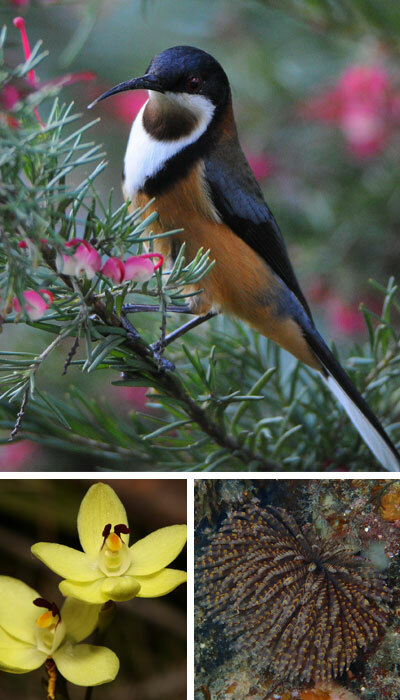 The Association also supports the Australian Naturalists Network. SEANA usually meets twice a year with the meeting (or campout) held in a town, at a conference centre or in an area with camping facilities. These meetings are organised by one of the member clubs. The campouts usually have a program of events over two or more days. Events may include outings and excursions, visits to places of natural history interest and lectures and demonstrations. The meeting may also include a biological survey of an area of interest. The formal meetings of the Association are also held during the program of events. Each Club is entitled to appoint one delegate for the meetings. Many other naturalists from the member clubs, or lone members, attend the campouts and the meetings. The Association is administered by a Committee of Management made up of nine members. Three members of the committee are elected at each annual meeting, and hold office for three years.